> Support > User Guide > How to use GIF to Video Converter? After launching the program, you will see the window below. Add gif files(or bmp, png, jpeg files) you want to convert. 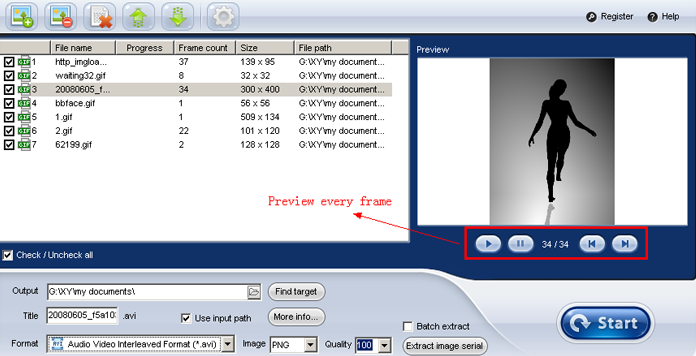 You can play the gif file you selected, and also preview frame by frame. Click "More info..." to get more output setting, include video encoder, frame rate, bitrate, size, background color, background music, custom logo, etc. As default, the output video files will save to the same directory of the original gif files. You can change to a specified directory. 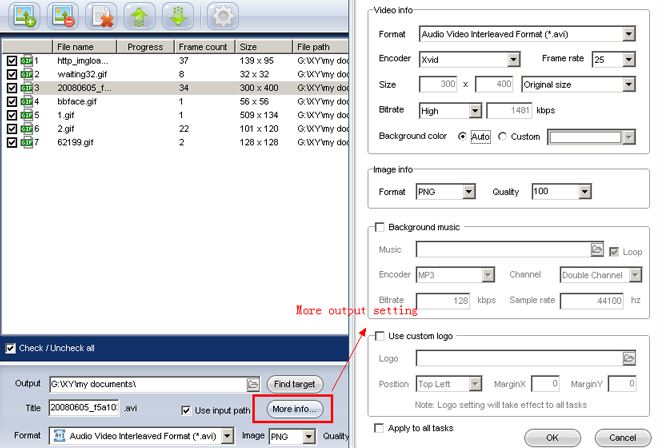 Choose a video format for the output, and then click button to start conversion. Or click to save gif file as png (or bmp, jpeg) files frame by frame. If parameter [Destination file] is missing, the output file will keep the original name and save to default directory which can config in software's option. "C:\Program Files\ThunderSoft\GIF to Video Converter\Gif2Video.exe" "C:\test.gif"
"C:\Program Files\ThunderSoft\GIF to Video Converter\Gif2Video.exe" "C:\test.gif" "C:\dest.avi"
If parameter [Destination directory] is missing, the output file will save to default directory which can config in software's option. Parameter must be one of these types: PNG; JPEG; BITMAP.